TASTE Cumbria’s newest event in Kirkby Lonsdale has been deemed a huge success – and now attention turns to the Spring bank holiday festival. The popular programme celebrating the best in the county’s food and drink producers, held in association with Cumbria Life magazine, has expanded in 2017, visiting Kirkby Lonsdale for the first time over the Easter weekend. Now all preparations are being made for the latest visit to Ulverston, as Taste Cumbria fills the streets of the town for the fourth year, on Saturday May 27 and Sunday 28. Mandy Norwood of CN Events was the organiser of Taste Cumbria Kirkby Lonsdale. She says: “What a fabulous first event in Kirkby Lonsdale. The feedback from traders and businesses has been great and there are already calls for us to set a date for next year. 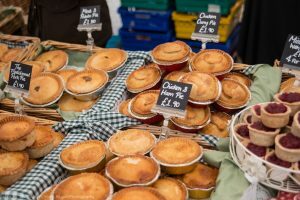 Last year’s Taste Cumbria Ulverston event attracted around 15,000 visitors, and 2017 promises to be just as appetising, with around 60 traders in the producers’ market. The chefs’ demonstration stage will move outside the Laurel and Hardy museum on Brogden Street to give more space for people to sit and see the experts in action. It will also be next to the picnic area so people can eat and drink as they watch. The team from Ford Park will provide plenty of activities to keep little food fans entertained, with themed arts and crafts using materials from their parks and gardens. Festival organiser Marie Whitehead, director of CN Events, says: “We’re really looking forward to taking Taste Cumbria back to Ulverston again this year. “They don’t call this the festival town for nothing – it’s such a great location for us and all our visitors. There are a few trade stand spaces left for food and drink producers at the Ulverston event. Call 01228 612000 for details.